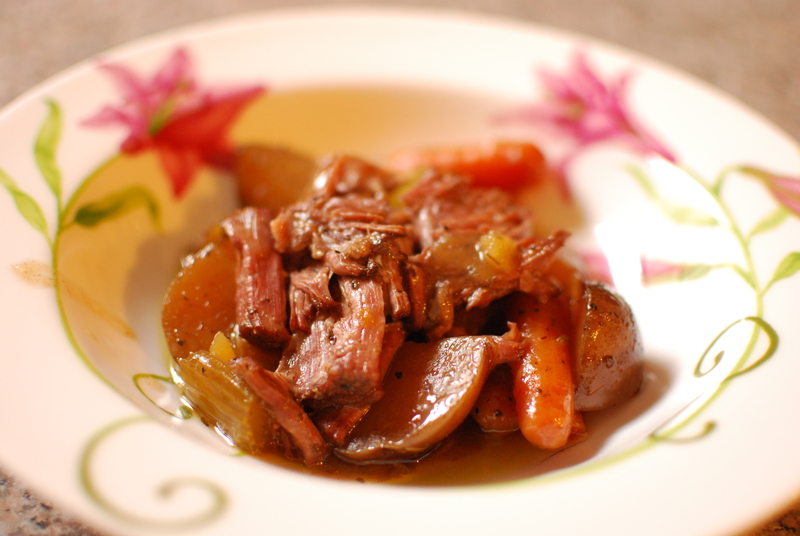 Nothing says comfort food like pot roast, and this is the BEST pot roast I’ve ever made! It was so good. Even the kiddo who never likes her food to touch devoured this meal and asked for seconds. Score! And it was made in the crockpot. Double score! Definitely company worthy. Triple score! Need I say more?!?!? Recipe adapted from Joyously Domestic. Combine steak seasoning through Italian Seasoning in a small bowl. Set aside. Coat both sides of meat with olive oil. Sprinkle on a third of the seasoning mix onto each side. Heat a skillet over medium high heat and sear both sides of the meat; then transfer roast to crockpot. Place the vegetables in a large bowl. Drizzle on a little olive oil to coat vegetables. Sprinkle on the remaining seasoning mix. Add the vegetables to the same skillet that was used to sear the meat. Sauté for about five minutes, stirring occasionally. Transfer the vegetables to the top of the roast in the slow cooker. Combine beef broth and cornstarch in a bowl and then pour mixture over meat and vegetables. Cover with lid. Cook on LOW for 9 hours or HIGH for 6 hours.